>> NEW ON DVD: A significant piece of sporting history is brought to vivid life in 42, a well-made, no-holds-barred biopic that illuminates the story of Jackie Robinson, the first Black man ever to play major-league baseball in the States, consequently breaking the proverbial colour barrier at the height of the Civil Rights Movement and racial segregation. 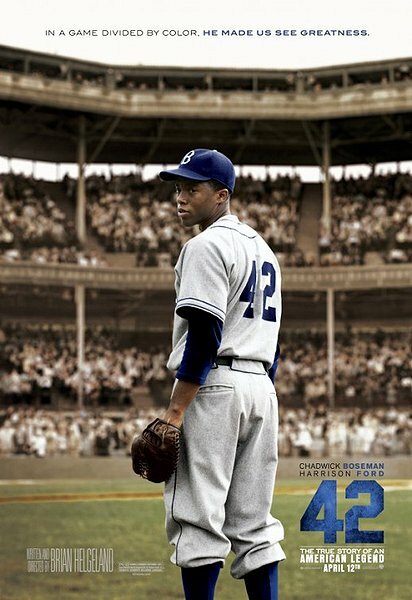 Chadwick Boseman brings easy-going charisma and utter conviction to the central role, conveying Robinson's inner strength and take-no-mess demeanour as he strives to make the most of this unprecedented opportunity (thanks in large part to Brooklyn Dodgers manager Branch Ricky, an excellent Harrison Ford) in the face of unimaginable oppression and vicious racial prejudice. In the end, spurred by sheer guts, the love of a good woman (Nicole Beharie) and his awe-inspiring talent, Robinson, who passed away in '72 at age 53, emerges simply as a heroic figure who was ahead of his time. >> ALSO RENT THESE: Two more essential sporting dramas: Will Smith floats like a butterfly as Cassius 'Muhammad Ali' Clay, giving an Oscar-nominated performance in 2001's widely acclaimed Ali. Denzel Washingon captivates with one of his most powerful silver-screens portrayals as imprisoned pugilist Rubin Carter in The Hurricane (1999).